Orders must be placed Nov 6 between 12:01 am to midnight PST. See Color Chart for colors. For a stronger, softer and smoother tee, look no further than this basic that's crafted from 100% organic ring spun cotton which minimizes environmental impact because it's grown without harsh chemicals. 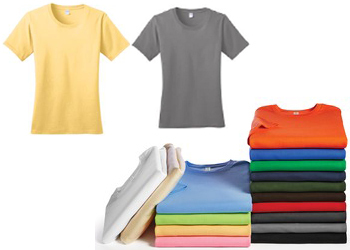 LADIES COLORS: Black, Charcoal, Medium Grey, Navy, Royal, Light Blue, Natural, White, Candy Pink, Daffodil Yellow. Limited quantities of Red and Lime. 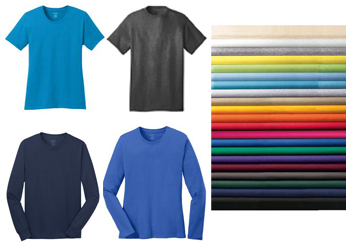 Protect yourself in the sun with this 4-ounce, 100% polyester interlock performance T-Shirt. 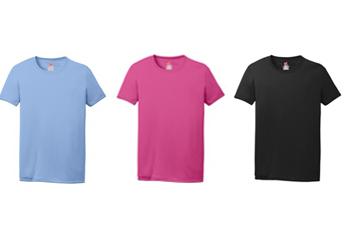 LADIES COLORS: Black, White, Navy, Light Blue, Wow Pink.